That's what this recipe will leave you with, but little kids love it, and grown kids will ask you to please make it for them to take to work.....no kidding. Especially if it's your middle child. So let's get started, shall we? 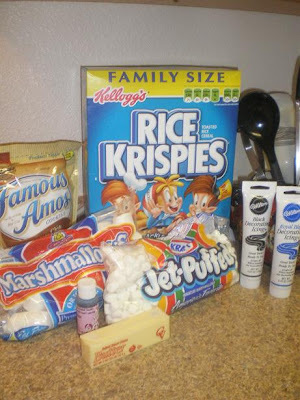 Here is the cast of characters ingredients. 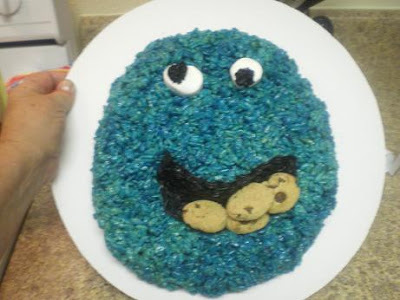 Rice Krispies, miniature marshmallows, one stick of butter, blue food coloring....lots of it, tube of black icing, two large marshmallows, chocolate chip cookies. 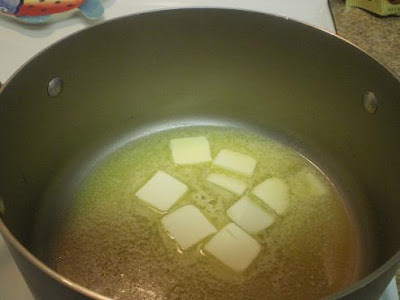 First, melt the stick of butter over medium heat in a six quart sauce pan. 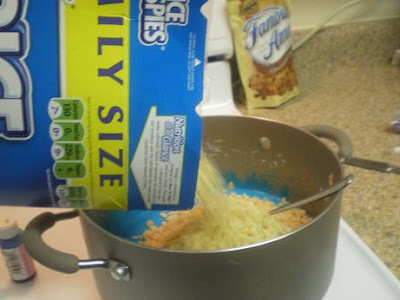 Add one bag of miniature marshmallows. Stir until melted, then remove from heat. 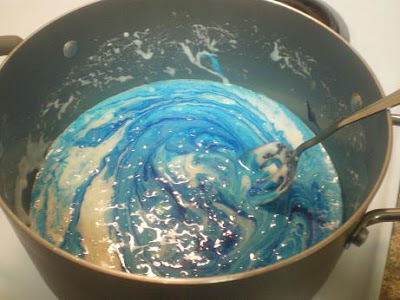 Add blue food coloring to butter/marshmallow mixture. 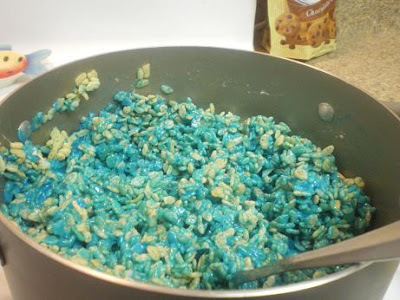 All of the cereal is completely covered with the blue stuff. 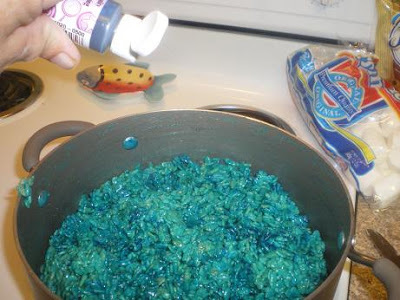 If you want it darker, add more blue food coloring. FYI, I buy the large one ounce bottles of food coloring at Hobby Lobby. It's more economical than those sets of four colors. 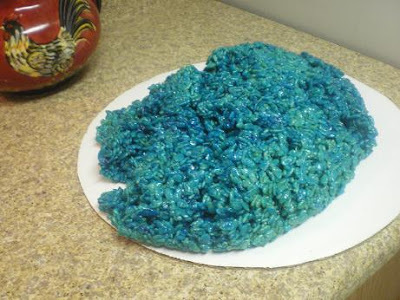 Dump the blue cereal mixed with the blue stuff on a platter, or as you can see, I use a 14" cake round. That way I don't have to worry about one more cake platter disappearing into a black hole somewhere, never to be seen again. While the mixture is still supple....I love saying supple. Anyways, while it's still supple, make two indentations for eyes with your fingers...then insert a large marshmallow for each eye. Again, while the mixture is still supple giggle giggle make a crater for the mouth, and ice it with black icing. Shove some chocolate chip cookies into the mouth while the icing is still.......soft. There you go!! A Sesame Street Cookie Monster. You can do Elmo, Big Bird, MadonnaThe Grouch, or any other character. Fun and easy to make in about 10-15 minutes. 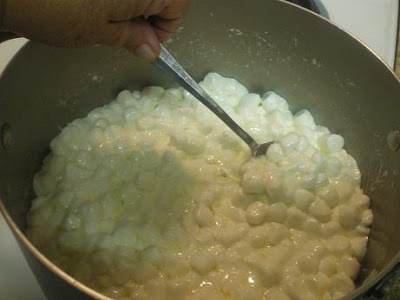 Two large marshmallows, melt the stick, supple, shoving, remove from heat...pardon me, Grandma J. Do you write for Harlequin Romance? I love it. I'm making it. Tonight! That was pretty cruel, what did your middle child do to make you post that picture. 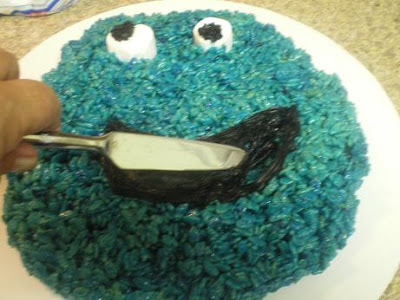 I made a CM cake, and an Elmo cake this year.....gonna have to do a rice krispies version...I love those things. I love it! I'll have to keep this in mind when little Jack grows up. Mmmm and that sounds good about right now! Thanks for the donation! Very cute and a great size! I have it posted and finally was able to link to Paypal...never could make it link last year and gave up...it only took an hour and a half tonight....Happy TG! That is so cute! You are such a good grandma. Lucky, lucky kids! Hilarious! That cookie looks damn good! I'm going to HAVE to find a reason to make this!! It is SO cute! Could I borrow your grandchildren some time? ?